I have been making this recipe from my Mom’s recipe’s since I can remember. As the bread is baking, memories come flooding back from childhood, skating up and down the drive way, picking avocados from our tree. Always having loads of zucchini and tomatoes in the summer. Since we are to have what they say is the last snow fall before spring, I dream of summer. 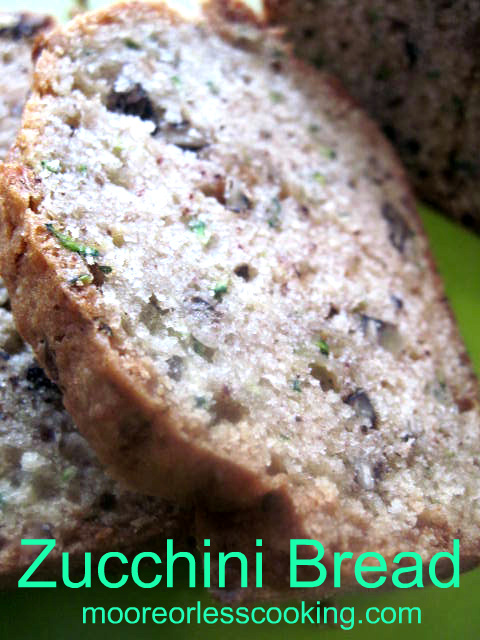 This is as close as I can get to summer with this perfectly moist, delicious Zucchini Bread. Makes two loaves. 1. Preheat the oven to 350°F (175°C). Grease two 5 by 9 inch loaf pans. 2. In a large bowl, mix together the oil, sugar, eggs, and vanilla. Set aside. 3. In a separate bowl, combine flour, cinnamon, baking powder, soda and salt. 4. Add dry ingredients to egg mixture. 5. Fold in zucchini to batter. 6. Fold in the nuts if using. 7. Divide the batter equally between the loaf pans. Bake for 80 minutes (check for done-ness at 70 minutes) or until a wooden pick inserted in to the center comes out clean. Cool in pans for 10 minutes. Turn out onto wire racks to cool thoroughly. One of the things I love the most about making a recipe that’s from family is how it can take you back, bring back memories just by the taste or the smell. It’s one of the magic qualities of food. Can’t wait for the summer and all the fresh zucchini. I don’t have a garden, but I have neighbors who have gardens and that’s just as good.